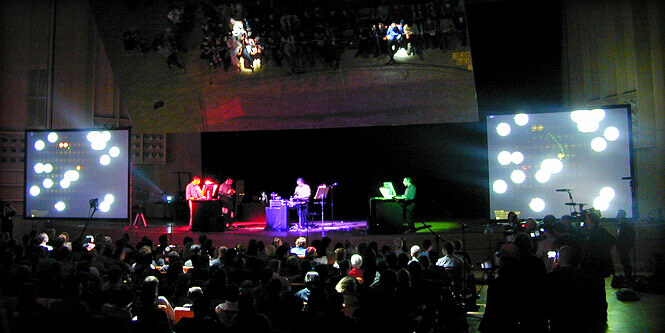 Dialtones (A Telesymphony) (2001-2002: Golan Levin, Gregory Shakar, Scott Gibbons, Yasmin Sohrawardy, Joris Gruber, Erich Semlak, Gunther Schmidl, Joerg Lehner, and Jonathan Feinberg) is a large-scale concert performance whose sounds are wholly produced through the carefully choreographed ringing of the audience’s own mobile phones. 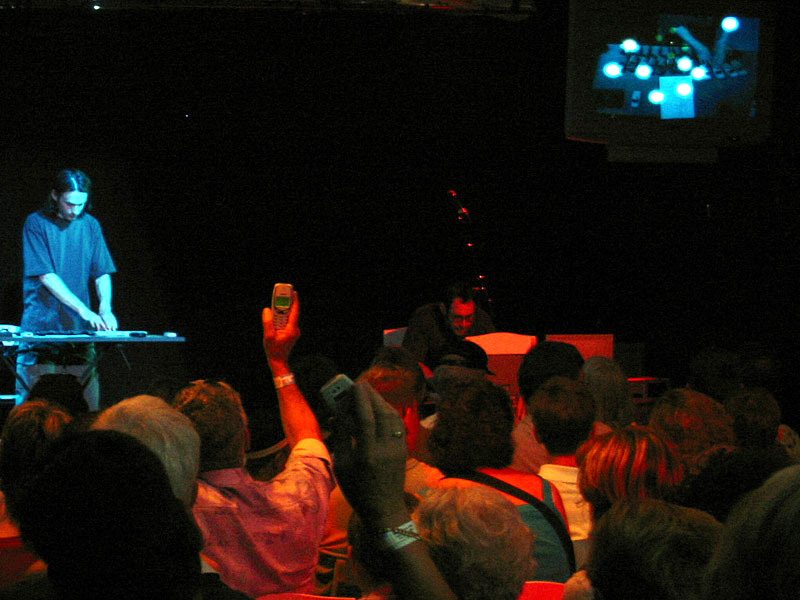 Before the concert, participants register their mobile phone numbers at a series of web terminals; in exchange, new ringtone melodies are automatically transmitted to their phones, and their seating assignment tickets are generated. 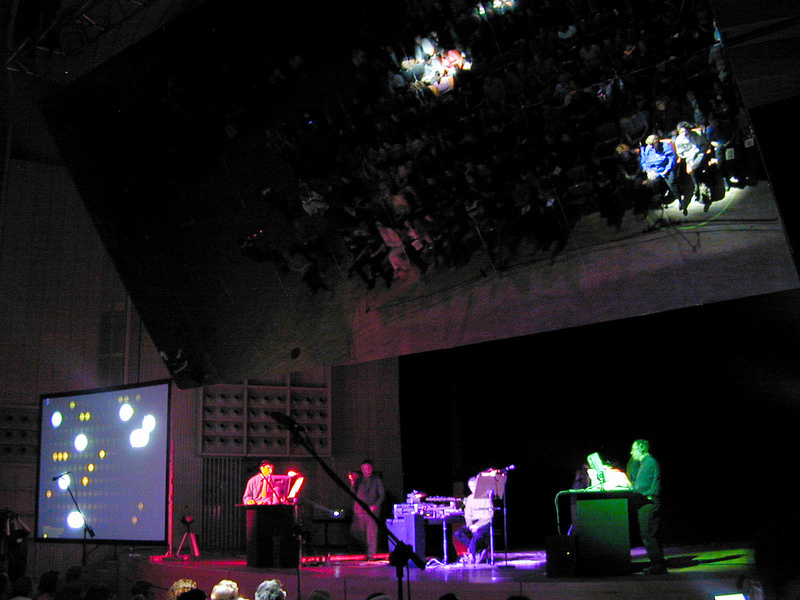 During the concert, the audience’s phones are dialed up by live performers, using custom software which permits as many as 60 phones to ring simultaneously. 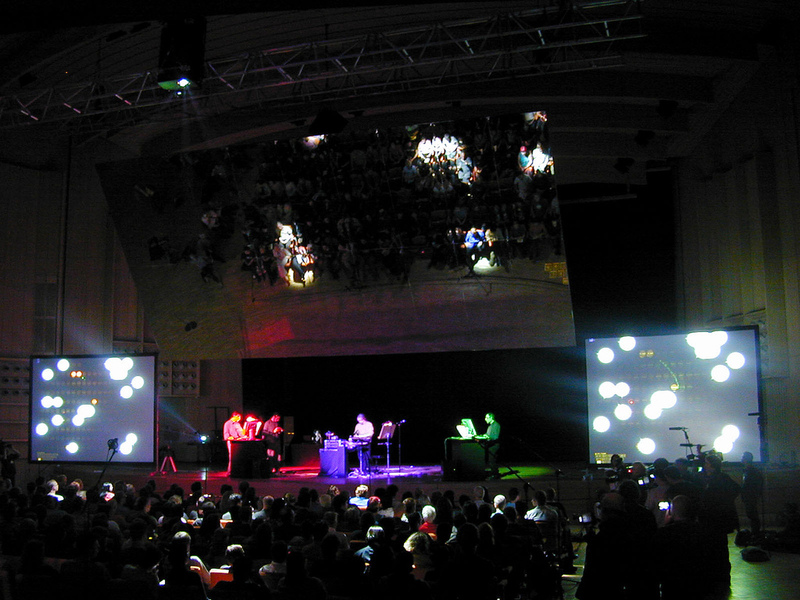 Because the exact location and tone of each participant’s mobile phone is known in advance, the Dialtones concert is able to present a diverse range of unprecedented sonic phenomena and musically interesting structures, such as waves of polyphony which cascade across the audience. 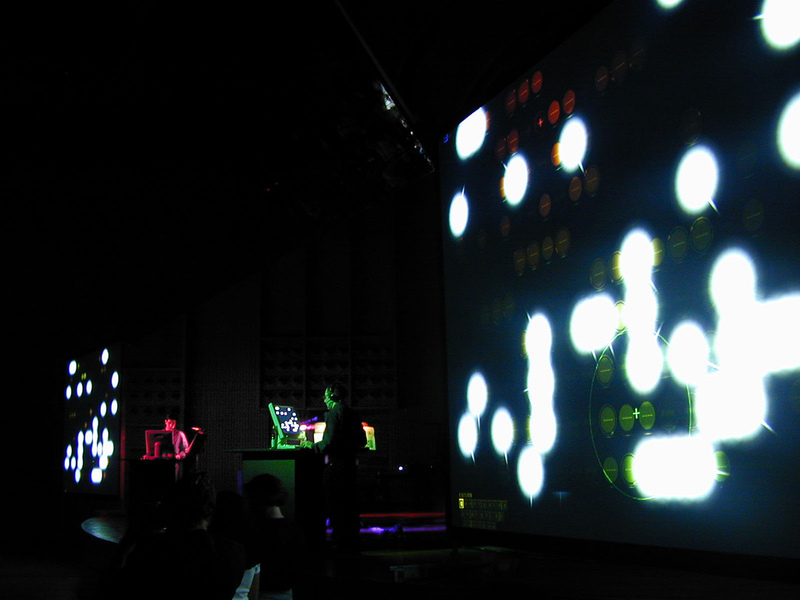 Dialtones was presented at the Ars Electronica Festival in September 2001, and at the Swiss National Exposition in May and June of 2002. Detailed information about Dialtones is available at its official web site. High quality images of Dialtones are available from this Flickr photoset. A print-ready report about Dialtones is available here [1.86 MB pdf]. An informal catalogue of related mobile-phone art projects can be found here. 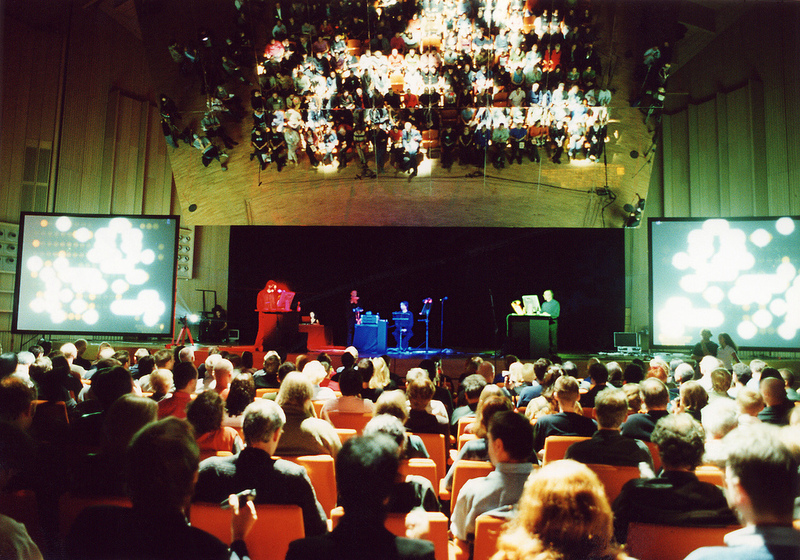 The following YouTube and Vimeo videos present a selection of excerpts (9'01") from the premiere of the performance at the 2001 Ars Electronica Festival; an alternative edit (8'00") showing different scenes from the Ars Electronica performance; and an interview with the Dialtones artists (3'44"), in which the motivation and mechanism of the performance are discussed. These videos can also be downloaded in better quality at the bottom of this page. 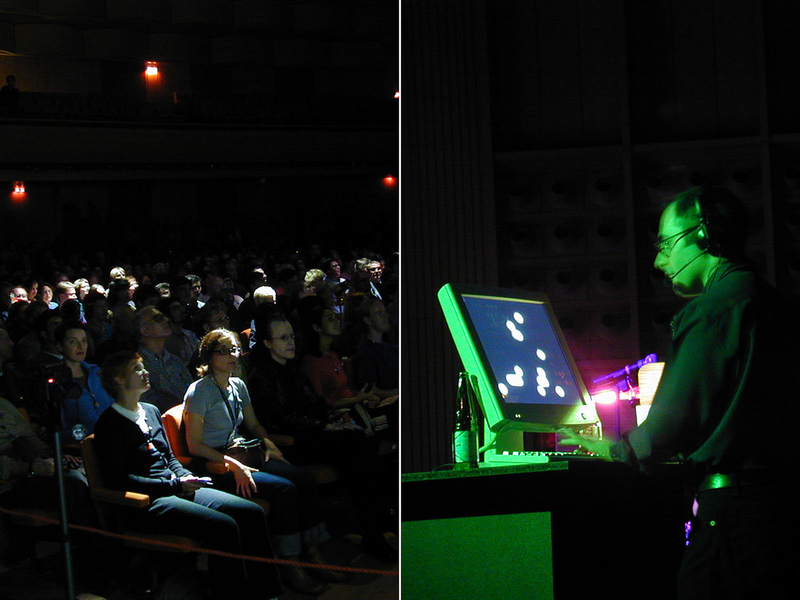 Courtesy Ars Electronica Festival, Linz.